New Year’s resolutions: Reading a book every day. I made a New Year’s resolution to read a book a day in 2012. In 2013, you can too. Like many of you, I have a nagging problem: I’m not a heroin user. Nor am I a knuckle-cracker, a nail-biter, or a thumb-sucker. I (usually) pay off my credit cards every month. I travel, I see my family, I’m not stressed. And the big three—drinking, dieting, and smoking cessation? I’m good. I had the same dilemma last year, and my solution, while ingenious, turned out to be quite a challenge. I decided that I would read more. Not a book a month, or even a book a week. One entire book every day. Three hundred sixty-six books by year’s end. “Challenge accepted!” the Barney Stinson of my soul boasted. No sweat. If you’re like me, the list of books you want to read is a hydra. Cutting one head off (that is, reading a book) just scribbles new titles onto the list. I’m never ahead. My whole life I’ve been fighting this hydra tactically, trying to bleed a head dry by reading, say, one of Bob Woodward’s or Neal Stephenson’s books every year. But they keep writing more books! Time for a new solution: overwhelming firepower. Force-feed my eyeballs like every tomorrow was a final exam. By year’s end, my 366 books would have that hydra on its knees. And, believe it or not, it worked. In the cold light of New Year’s morning, my challenge seemed a bit daunting. So I gave myself a week. If I didn’t have seven books finished by Jan. 7, I obviously wasn’t going to be able to keep such a meth-addled pace. The resolution almost didn’t last 24 hours, but New Year’s night I forced my eyelids open and read a short horror novel. The following day I finished Cinderella Ate My Daughter, which, despite its title, was not a horror novel but a pop-culture history I’d been working on for a few days. The day after that I peeled off a Walking Dead collection. Driving to work, I hit the final disc of a Nelson DeMille audiobook. The night after that, I read the final chapter of a Narnia book to my daughter at bedtime. Seven days, seven books. So far, so good. A good six of those books were timing and luck—it can take me three weeks to finish an audiobook, and more than a month to finish a bedtime story. But I gave it another week. And another. Soon my every waking thought was on reading. The prime directive for this sort of project, you might think, is to pick short books. I don’t deny that 2012 was not the year for me to launch into Terry Goodkind. Want some Tolstoy? The Forged Coupon, not War and Peace. But as it turned out, Read Short Books was rule No. 2. My plate is already pretty full: I work full-time, try to be a good husband, and am always up for a good game of Pretty Pretty Princess. Mine isn’t a tougher schedule than that of other working parents, but it is tough. So the challenge was to see if a heavy-lifting year of reading could be done almost exclusively in the crumbs of found time in my life. The oil-change can wait, I don’t need those sick days or lunch hours. My test for this was my wife: I didn’t even tell her I was tackling a book a day until six weeks into the project. If she suspected I was slacking—dishes undone, litter box a ruin, laundry growing sentient—then I was failing my prime directive. The idea of a full book a day—going from title page to back-jacket blurbs—went quickly out the window. I read lots of books at once, and can go days making progress in five or six volumes without technically finishing any of them. Then there are flat-out busy days, where the actual drop-dead demands of my job and parenting mean there is not a second to spare for reading. My worst lull was during a Florida trip, when I barely plowed through the 300 pages of John Irving’s The Fourth Hand. And that was during a whole week of family vacation—the time when normal people read more. It took a month of catchup to get back at pace. But for every period behind the eight ball, I had weeks when I was days or even weeks ahead of schedule. A slack day at work, an hour doing yard work with the iPod, a solo plane ride or overnight stay—these were my moments, and I seized them. Believe it or not, I grew so far ahead of my pace that I successfully read all 1,016 pages of George R.R. Martin’s A Dance With Dragons. It took me three full weeks, but I slew that Dragon. I did have to give up some things. I listened to audiobooks exclusively—no music for me. I gave up video games, which wasn’t as big a deal for me as I expected it would be. Mainly, though, I decided that Starship Troopers 2, Lost Boys 3, and Saws V-VII weren’t worth the midnight oil I was expending on them. Yes, you, too, can read a book a day, just by giving up direct-to-DVD horror films! If you’re hoping to read a book a day, I also encourage shamelessness. You don’t see salad-eating contests on the Fourth of July; you see hot dogs. So I grabbed as much literary junk food as I could stomach for the days when I wasn’t reading a “real” book. For you, that might be erotica, or category romances. It might be fan fiction or Star Wars novels, pulps or New Age tracts. Whatever floats your boat. Reading is reading. My particular boat, by the way, was floated by the following, each of which I read to a double-digit degree: zombie novels, books about Old Hollywood, books about video games (I can’t play you anymore, but I can read about you! ), comedians’ memoirs, and essay collections. Here’s another not-so-shameful secret: capes. Superheroes have saved me so many times I might as well be Lois Lane. I can start and finish a six-issue collection of Captain America or Green Lantern comics in less than an hour. That’s a book, or at least it is under my definition of “something printed that cost about $20.” Don’t blame me, blame Marvel Comics. And lest you think all I did was splash in the literary kiddie pool, I also read works of Virginia Woolf, Willa Cather, Nicholson Baker, Thomas Hardy, James Baldwin, Umberto Eco, and Weird Al Yankovic. I have now read everything by Mary Roach and Alice Sebold, and am thiiis close to having the complete set of Bill Bryson and Sarah Vowell. If you follow my path and read a book a day in 2013, you’ll find that you truly, truly will not be reading more than usual. Right now, you are probably reading a comparable amount to me—but you’re reading newspapers, Facebook and Twitter, and the work of the fine folks at Slate. I let that stuff go for a year in the interest of making my quota. (Maybe that’s why I liked essay collections so much; they’re like magazines in book format.) I always dreamed that in retirement I might be able to knock off a book a day: Turns out, I didn’t have to wait. Truth be told, I’m a day or two behind right now, with the thousand-pound hammer dropping on New Year’s Eve. I’m confident I can scramble my way to all 366 books, though I may need to break my min-maxing vow and ask my wife for help with the laundry. And I already know what my New Year’s resolution will be for next year. 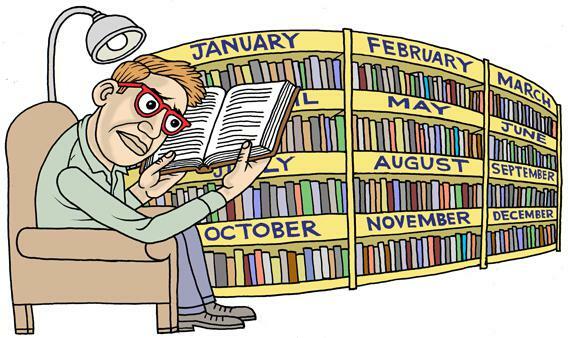 Should be easier to do in 2013: That’s only 365 books, not 366. Video Explainer: How do astronauts celebrate New Year’s Eve in space?